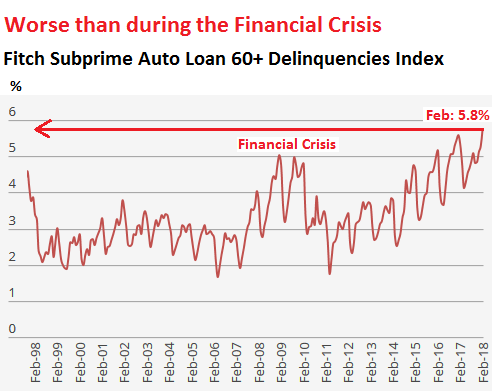 The subprime car-lending industry -- charging exorbitant rates for car-loans to people least suited to afford them, enforced through orwellian technologies, obscuring the risk by spinning the debt into high-risk/high-yield bonds -- is collapsing. The three most prominent lenders in the subprime auto sector shut down spectacularly and suddenly through bankruptcies and fraud investigations (and the bankrupt ones are said to have been fraudulent!). Meanwhile, the borrowers -- lent money that everyone understood they couldn't afford, backed by assets that depreciated by 50% the day they were acquired -- are defaulting and missing payments like crazy, at a rate that puts the subprime housing bubble in the shade. The subprime lenders got their capital from big banks and private equity firms, who are left holding the bag when the subprimes disappear into bankruptcy. This is one of the credit bubbles whose bursting the Wall Street Journal predicted, and while its absolute magnitude is smaller than the subprime housing bubble, and while cars are more liquid (and thus easier for creditors to sell and get some cash out of), it will have knock-on effects for car-makers, dealers, and the banks and PE firms most exposed to the sector -- to say nothing of the borrowers who depended on the subprime sector for work-related transport in a nation where underinvestment in public transit has turned the carless into economic roadkill. Summit Financial Corp, a privately owned company that works with auto dealers in Florida, filed for Chapter 11 bankruptcy on March 23, after it “performed an extensive analysis of alternatives,” its attorney said in a statement. Summit blamed Hurricane Irma. But Bank of America – which, as Summit’s largest secured creditor, is owed $77 million – alleged in the bankruptcy documents that Summit had repossessed many cars without writing down the bad loans, thus under-reporting the losses. “The move allowed the company to hide operating losses and borrow more money to fund loans, the bank said,” according Bloomberg. Spring Tree Lending, an Atlanta-based specialized subprime auto lender, is being pushed into bankruptcy by a creditor who filed to force the company into involuntary bankruptcy on March 28. Fraud allegations are swirling. Pelican Auto Finance, which specialized in “deep subprime” auto loans shut down last month, after private equity firm Flexpoint Ford LLC, decided to cease funding it. “There’s been intense competition. The margins just aren’t there,” Pelican CEO Troy Cavallaro told Bloomberg. Other PE firms that have together plowed about $3 billion into the subprime auto loan bonanza, based on data cited by Bloomberg, are now licking their wounds, unable to get out.